Enter Donald Trump, stage right. His speech to the assembled United Nations hasn’t gone down very well at all with globalists, socialists, Europhile Remainers and those who long for the day when Israel is wiped off the map. 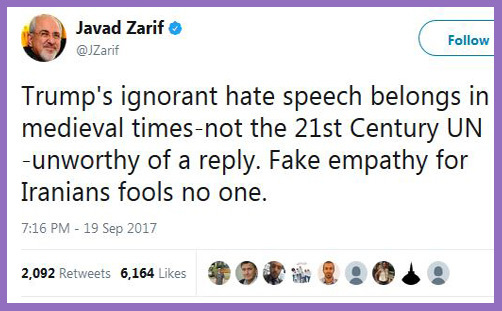 Indeed, it was termed “hate speech” by Javad Zarif, the Foreign Minister of the Islamic Republic of Iran, who is of the view that the President’s rhetoric “belongs in medieval times – not the 21st century UN”. Which is interesting, because one or two things in Iran belong in medieval times, too. President Trump threatened to “totally destroy” North Korea. He threatened this not because he’s a bit bored and quite keen to usher in nuclear Armageddon, but because Kim Jong-un (“Rocketman”) is a manifest threat to world peace. Funny how so much of the Trump-loathing media seem to ignore the fact that “totally destroy” was preceded by “if (the United States) is forced to defend itself” (ie against attack by North Korea). What’s wrong with self defence? What’s wrong with proportionate retaliation? Or is total destruction slightly disproportionate? Is that what’s so offensive? When you’re firing ICBMs over your southern neighbour and menacing Japan with nuclear payloads, something needs to be done, doesn’t it? “If the righteous many don’t confront the wicked few, then evil will triumph,” the President said. It’s very odd how this threat to “totally destroy” North Korea has offended so many. Isn’t it simply a straightforward statement of nuclear deterrence? Isn’t it the implicit defence policy of all nuclear nations? By stating it so baldly, isn’t President Trump merely reiterating the Cold War policy which kept the peace in the second half of the 20th century? What’s so medieval about that? Isn’t bombast and rhetorical flourish preferable to bomb blasts and an atomic skirmish? The Trump-loathers will dismiss talk of “strong sovereign nations” as nationalism or American imperialism. And as for “life intended by God”, you can hear the liberal chorus of Christian condemnation. How dare he. How very dare he. That they should seek the Lord, if haply they might feel after him, and find him, though he be not far from every one of us (Acts 17:26f). …But each day also brings news of growing dangers that threaten everything we cherish and value. Terrorists and extremists have gathered strength and spread to every region of the planet. Rogue regimes represented in this body not only support terror but threaten other nations and their own people with the most destructive weapons known to humanity. Authority and authoritarian powers seek to collapse the values, the systems, and alliances, that prevented conflict and tilted the word toward freedom since World War II. International criminal networks traffic drugs, weapons, people, force dislocation and mass migration, threaten our borders and new forms of aggression exploit technology to menace our citizens. Is the United Nations really effective in countering these threats? How effective has it been in the administration of mercy and justice? How is it that Saudi Arabia sit on its Human Rights Council when the regime crucifies children and teenagers? How do they qualify for a place on the UN Women’s Rights Commission when their women aren’t even allowed to drive? Why does the UN manifest a consistent anti-Israel bias in allowing “a number of standing committees, which far too often serve no purpose other than to attack Israel and inspire the anti-Israel boycott, sanctions and divestment (BDS) movement”? “In America, we do not seek to impose our way of life on anyone, but rather to let it shine as an example for everyone to watch,” President Trump said. He came to the United Nations to shine a light on its deficiencies, delinquencies, biases and prejudices. He did not say that the United States is a ‘holy nation’ of God’s people surrounded by pagans and idolaters, but he is persuaded that it has been chosen by God to lead the free world to blessing and salvation; that it is an instrument of God’s purposes and an object of God’s mercy. If King Cyrus could be appointed by God to achieve His purposes (Is 44:28-45), let us at least entertain the possibility that Donald Trump streams with living water. Forget the imperfect mediating vessel and the liberal media onslaught against him: read his words for yourself. He gives the world a universal vision of peace and reconciliation, exhorting worship of the true and living God. Perhaps President Trump is a man with whom the Archbishop of Canterbury can do business.